Cotton hand towel. 800 GSM. Zero twist, two-ply back. Machine wash. 625 GSM. Ringspun zero twist cotton. Machine wash.
Cotton hand towel. Striped pattern with checkered border. Striped towels with check ends. Cotton. Cotton bath towels. 600 GSM weight. Machine wash. Made in Portugal. Towels made of cotton. 600 grams. Machine wash. Cotton bath towels. Trellis pattern with checkered border. Dry off with the Dkny City Bloom Bath Towel. Pleasantly designed in a floral petal pattern with a solid end hem that gives this lightweight terry cotton a stylized appeal. Pair it with the City Bloom shower curtain and rug for a complete look. An homage to Manhattan's skyline, this High Rise bath collection from DKNY adds some chic contemporary style to your bathroom with its sleek architectural design featuring a skyscraper-like window motif. Bring a touch of modern luxury to your bathing essentials with the exceptionally soft, ultra-absorbent cotton and stylish puckered dobby trim of these decor-friendly Mercer towels from DKNY. Add some spa-quality style to your bathroom's decor with the chic colorblocking and artful geometric pattern of this Crossway cotton bath collection from DKNY. Give your bathing essentials a cool modern makeover with the attention-grabbing patterns and contemporary tones of this super-soft Geometrix cotton bath collection from DKNY. The Laundry by Shelli Segal interlock canvas jacquard bath towel is the perfect combination of form and function. It's high-low construction of interlocking circles adds a beautiful decorative touch to any bathroom. At 27" x 52", it's generous sizing will make this a favorite for the entire family at shower or bath time. The decorative end-hem coordinates with the jacquard design. Upgrade your bathing essentials with the super-soft cotton and stylish embroidered logos of the All American II bath towel collection from Tommy Hilfiger. Refresh any bathroom's look and feel with the incredibly soft two-ply cotton and decorative dobby border of these Harper bath towels from The Laundry by Shelli Segal. 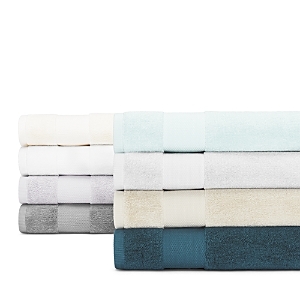 Wrap yourself in comfort with the Vera Wang Modern Lux 3 Piece towel set. The neutrals you need. The colors you crave. The kate spade new york Chattam Stripe Bath Towel Collection delivers pure cotton plushness with stylish stripes and a subtle signature woven into each piece. Bring a breezy, ultra-soft look and feel to any bathroom with the super plush cotton and classic jacquard borders of these luxe Kindness towels from ED Ellen Degeneres. Crafted in organic Turkish cotton khadi cloth, these lightweight towels by Coyuchi are both absorbent and quick drying, elevating your bath to a spa-like experience. In Turkey, where bathing has been raised to an art, khadi is the traditional choice for toweling. Lightweight and textural, the weave absorbs well, dries quickly and feels great against the skin. 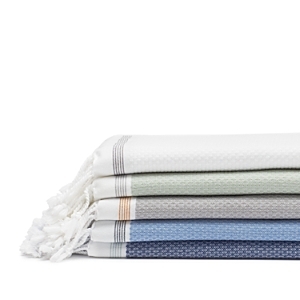 Coyuchi's khadi towels are loomed from soft organic cotton in yarn-dyed stripes and edged in hand-knotted fringe. Lightweight and absorbent, this plush towel collection by Coyuchi is crafted from organic Turkish cotton. Durable, luxurious and absorbent, the Waterworks Edisto bath collection is made from durable long-staple cotton with three-ply terry loops and feature deluxe woven hems for an elegant finish. These densely packed, combed Turkish cotton towels achieve the perfect balance between absorbency and softness. Choose from an array of colors inspired by water and natural elements. 700 GSM luxury weight, double dobby detail, plus optional monogram on body sheet, bath towel, and hand towel. Add some resort quality style and comfort to your bathing essentials with the incredibly soft, ultra-absorbent cotton of this Turkish Spa towel set from Avanti. Add a touch of stylish distinction to your bathroom's essentials with the refreshing diamond dobby borders of this super-soft cotton towel set from Eileen West. Ultimate softness combined with gorgeous rich colors and modern, tailored border make this towel ensemble a great addition to any bath. 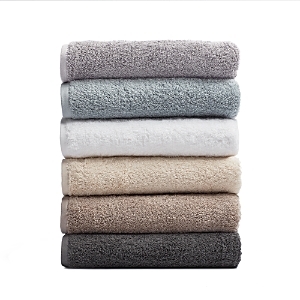 The color palette features white, linen, teal and dark grey This Home Resort 100% cotton zero twist ultra-soft and absorbent 6 piece towel set will add luxury to any bath decor. The yarns are treated with advanced Silvadur technology which reduces bacteria and odors. This helps keep the towels fresher longer and saves energy with less washings. This very durable construction features reduced linting and reinforced side hems. Our earth-friendly bamboo-viscose fabric provides the finishing touch to your bathroom makeover. Plush perfection and luxury softness combine to give your skin the ultimate in comfort. Extra-smooth, slightly twisted yarn is loomed perfectly to 600 grams per square meter for increased comfort. The Avanti Butterflies Bath Towel is adorned with intricately embroidered butterflies with metallic accents on a 100% cotton velour towel. The towel is finished with a coordinating metallic fabric border. Utterly classic, this Initial Script bath towel gives your bathroom that personal touch it deserves in a completely elegant design. Features a beautifully embroidered script letter of your choice on a soft cotton ground The Avanti Butterfly Garden II Bath Towel features a beautifully embroidered motif with roses, butterflies and words on a 100% cotton velour towel. Finishing the towel is a multi-colored vertical-striped fabric border with braided trim. Detailed with a light chevron tile border, our soft and supple pima cotton chevron border towel sets are crafted from lustrous extra-long staple American pima cotton fibers, prized for their strength and absorbency. Give your bathroom a makeover with the Inspire Bath Collection by Saturday Knight, featuring uplifting positive verses of faith and love in a collage of soft tan, cream, and burgundy adorned with dancing butterflies, dragonflies, and hummingbirds Give your space a warm autumnal glow with the rich hues and lovely leaf embroidery of this Sheffield cotton bath towel from Bacova.